The recommendation forms part of the State Government’s review into the South Australian Certificate of Education (SACE), released yesterday, which found this year’s Year 12 cohort was anecdotally “the most stressed cohort that school leaders have encountered”. The Marshall Government announced the review in June with SA Secondary Principals’ Association vice-president Wendy Johnson appointed reviewer. Johnson’s review found an “overwhelming consensus” that the current Australian Tertiary Admission Rank (ATAR) used to determine university eligibility negatively impacts on students’ subject selection choices and wellbeing. According to the review, students are more concerned about getting the best possible ATAR rather than focusing on their learning outcomes, meaning some students are turning away from subjects such as mathematics, arts, languages and sciences, opting instead to study “the easiest possible subjects to get the best results for their ATAR”. Students’ wellbeing has also been impacted by what Johnson described as “confidence-destroying rankings” given to students who do not seek an ATAR but who, because of their grades and subject choices, are not ranked highly. Of the 16 recommendations made in the review, Johnson noted the imperative for the SACE Board to work with the South Australian Tertiary Admissions Centre (SATAC) and universities to develop direct entry processes for university undergraduate courses based on school grades and “capability evidence”. SA Secondary Schools’ Association president Peter Mader said those capabilities would likely be aligned with the Australian Curriculum and would include skills in literacy and numeracy, critical thinking and cultural development. He said he welcomed the move to look beyond students’ grades to determine university eligibility and agreed with anecdotal evidence suggesting the ATAR has a negative impact on students’ wellbeing. “If you’re a student who is wanting to pursue a career that is linked to a university application, then that is a competitive process and as it currently stands that is determined by one score,” he said. “There is that increased pressure to get that score and it does become a stressful situation. 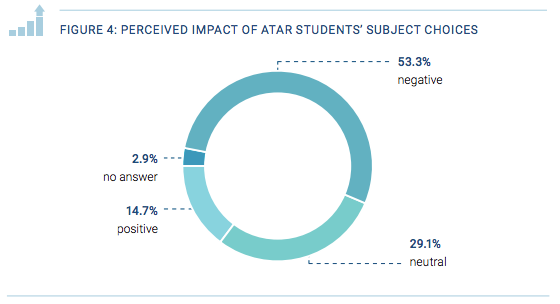 Mader said by counting student grades and capability evidence as part of the ATAR score, students would be able to prove a “broader evidence” of their suitability to attend university. He said measuring the capability areas could be achieved by having students create digital portfolios. In a statement to InDaily, a spokesperson from the SATAC board said the ATAR existed to provide a “consistent and equitable way to compare the overall academic performance of students in a given year”. “It has also been a good predictor of success at university… particularly among high and very high scoring students,” the spokesperson said. “While there are no current plans on the part of our member universities, or the Australian higher education sector more broadly, to cease using the ATAR, SATAC and its member universities are committed to ensuring transparent and equitable pathways into tertiary education. A spokesperson from Flinders University told InDaily the university was yet to assess the content of the review to develop an informed position on whether it would support a change to the ATAR. The University of Adelaide and University of South Australia have also been approached for comment. The SACE review also recommended the compulsory Research Project subject – controversially introduced under the former Labor Government in 2011 – be undertaken in Year 11 instead of Year 12, with an optional, revamped version available in Year 12. As InDaily reported previously, some educators have criticised the Research Project for restricting students to four subjects in Year 12 instead of five – with language subjects particularly impacted by the change. 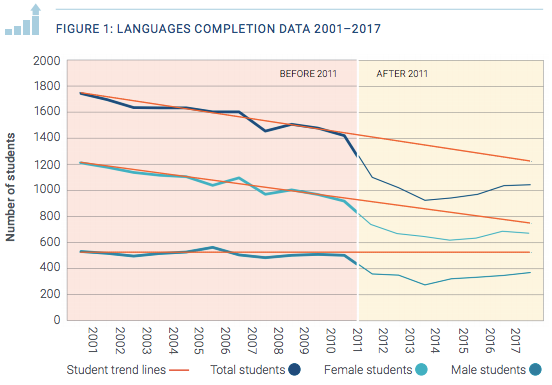 Johnson’s review cited SACE completion data for languages showing a drop in the number of students studying language subjects when SACE changed in 2011. “When the Research Project was launched into the content-driven, teacher-directed senior secondary environment, its difference excited some and dismayed others,” the review states. The Modern Language Teachers’ Association state branch president, Andrew Scrimgeour, said he welcomed the SACE review’s recommendation to make the Research Project an optional Year 12 subject, but he said there still remained “entrenched issues” that deterred students from continuing language studies through to Year 12. “Essentially it opens a pathway for additional language learning to happen into Year 12 but it doesn’t resolve the problem that has been entrenched – that students don’t think that languages are on an even playing field to other subjects to achieve a good ATAR,” he said. Scrimgeour said to increase the number of students continuing with language through to Year 12, more needed to be done to improve student attrition rates through middle school. In a statement released yesterday, Gardner said early discussions with the SACE Board suggested that the changes to the Research Project would be feasible for SACE Stage 1 students in 2021, with the potential for early adopter schools to make the move in 2020. He said the SACE Board had requested more time to provide their response to the recommendations, with a State Government response expected in the new year. SACE Board presiding member Jane Danvers said the Research Project was an important part of the SACE and the board was “constantly exploring how we can develop this subject to ensure it continues to meet the needs of today’s students”. “The board is carefully reviewing each of the 16 recommendations of the SACE Review and the potential implications these recommendations will have on the SACE,” she said.